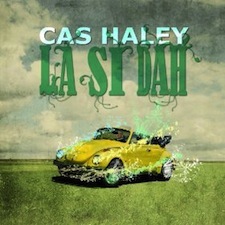 Album Review: Cas Haley "La Si Dah"
11.) How Soon Is Now? Bow wow, wow wow wow wowww. What the hell is that? That’s the sound of the big, beautiful groove that Cas Haley’s new album “La Si Dah” hits you with right from the start (it sounds far better on the album than could be replicated in type). Cas’s music escapes through the headphones like someone’s soul running into your mind. Tracks “Mama” and “Wait For Me” showcase the crystal-clear smoothness of a voice that is meant to inspire. When the music flows from so many different inspirational directions, it acts as a perfect sign of the times; there are millions of easily accessible sources of inspiration to draw from. “Lah Si Dah” delivers everything from Bob Marley-esque old-school reggae vibes, to the soul sounds of Motown. “Let Her Go” and “Mojo” could easily be hits in 1958. The album is just so freakin’ fun to listen to. Every couple of songs or so there is a funky full-song musical interlude. Then out of nowhere comes a beautiful reggae jam like “Slow Down”. Cas channels Bob Marley big time here, and makes it apparent that Mr. Nester was one of his biggest influences growing up. “Tally Tally” has an awesome cool intro... it feels like someone started a drum circle in your head. Reminiscient of Ben Harper’s “Burn One Down” in the beginning, the song takes a beautiful turn for the reggae. His voice winds in and out of the groove seamlessly, using a catchy melody strongly influenced by the drum beat itself. It’s an epic start to the last three songs on the album. “Start This Over” follows, and goes from a Beatle-esque intro into a full expression of sound that’s like the cooler version of that Lion King song (that soundtrack is rad too, don’t get me wrong). The final track, titled “La Dah”, is an upbeat jam that leaves you with a strong, positive vibe. Cas Haley knows that life is a big interconnected journey, and that’s the message he sets out to bring with his music. Finding much critical acclaim and success from his stint on America’s Got Talent, he chose to stay true to exactly what he wants; a feeling of oneness. “La Si Dah”, released on Easy Star Records (the leading U.S. independent reggae label), is fun on many different levels, and deserves your attention the whole way through.